The 2008 draft pool is considered the deepest in years and the Islanders are set to select higher in this year’s Entry Draft than they have in the past seven. With the Islanders selecting fifth in the 2008 NHL Entry Draft on Friday, June 20 in Ottawa, many highly-touted prospects will be available for the Isles to choose from. Each week leading up to the draft, Newyorkislanders.com will feature a new player who is likely to go early in this year’s draft. Update: Filatov appeared at both the 2008 under-18 World Junior Championships and 2008 World Junior Championships. He had an exceptional showing at both, but it was at the 2008 WJC where he made his mark. In the tournament, Filatov recorded four goals, five assists and a plus-seven rating. His nine total points ranked second at the tournament as he helped Russia claim the Bronze medal by recording two goals and an assist in a 4-2 win over the United States. Filatov appeared in 32 games with CSKA Moscow of the Russian Junior League in 2007-08, where he tallied 32 goals and 34 assists for 66 points in 32 games. 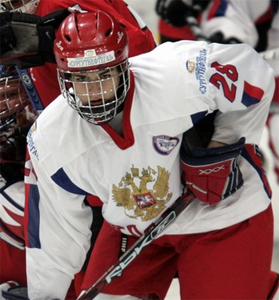 Strengths: Filatov boasts tremendous speed. His ability to see the open ice and pass - especially when moving at high speed - makes him a threat anytime he is on the ice. He has shown that he will attack the net and battle in the corners for pucks. Filatov plays at a very high intensity every shift on the ice. Save The Date – June 20! The Islanders will host an NHL Entry Draft Party at the Coliseum when the team selects fifth overall in the first round on Friday night, June 20. Save the date and stay tuned to newyorkislanders.com for more details on the return of the Draft Party!